See a comprehensive list of minimum temperatures for both Passiflora species and hybrids by Alain Clavet, to whom many thanks, here. See also my species & hybrids lists for temperature range for some Passiflora. Figures may vary between the two. 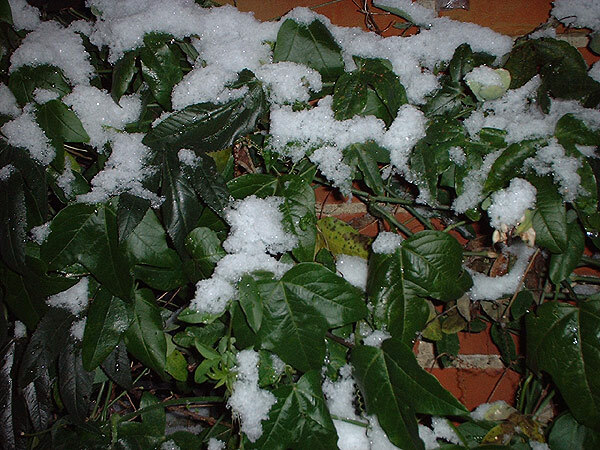 I have been growing P. caerulea, P. actinia & many Passiflora hybrids in heavy clay soil with winter temperatures down to -8°C/18°F for many years. Please note that the tips below refer specifically to growing in UK climate zone 8b, though they should also be of general use. 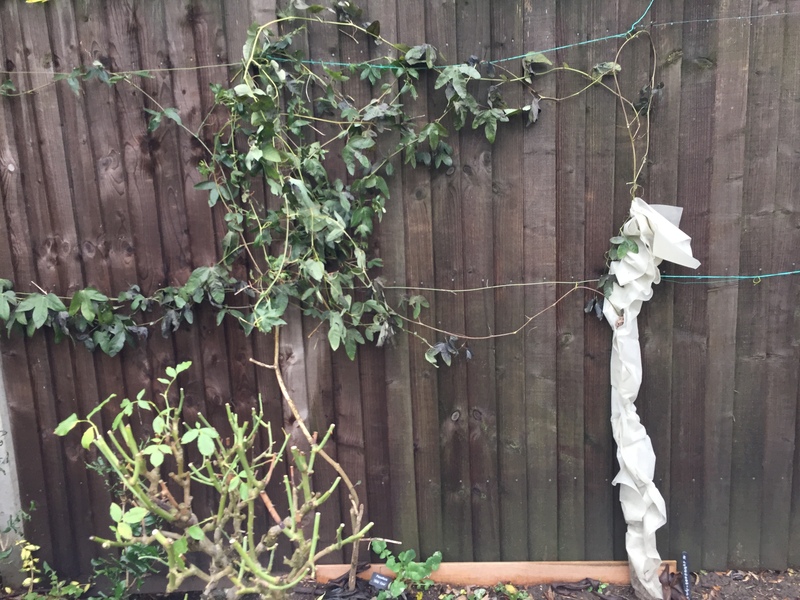 Note also that you can graft some Passiflora onto better rootstocks to help with hardiness, disease resistance or to prevent wilt, in for example heat sensitive Tacsonia. Put new plants outside in 5” progressing to 10″ pots – the large pots will encourage root growth. For more information see soil. Generally all Passiflora love sun but some Tacsonia can overheat. Bring them inside for the first winter & plant them as below in the ground next year. This will give best survival rates. Look for microclimates in your garden, even when it’s very cold there will always be some bits warmer than others.Put your plants in close to a wall or fence if possible, in beds that are South facing, dry, well drained & ideally hard against brickwork with overhanging eaves. They like a sheltered location without too much wind. The combination of cold winds from the North or East and frosts over winter can cause severe damage. Add sharp sand, stones or gravel if necessary to improve drainage & help plants establish roots. All Passiflora hate having wet cold roots. Train them up a diamond shaped wooden trellis or similar. If the soil is very high in clay it may be worth digging down the whole bed two spade depths or more & partly filling with sharp sand & rubble to improve drainage. Vanderplank also suggests raising the beds. I have found that most plants with small root balls struggle to establish in soil outdoors, teasing out the roots can help however. Even if you don’t prepare the whole bed, dig individual plants in with plenty of sharp sand suitable for garden use so soil is perhaps 30% sand – you could also mix in a little compost. It might also be worth using Perlite or Vermiculite to keep roots warm as well as to aid draining. Smaller plants can particularly struggle to establish themselves, being under attack by pests & diseases, with leaves looking a bit yellow or crinkly with feeble flowers. Generally be very sparing with watering & feeding to force the young plants to make deep roots quickly. Once the plants are established they should grow really well, but if the winter is too wet you will lose some – resist watering next year until they are visibly growing. 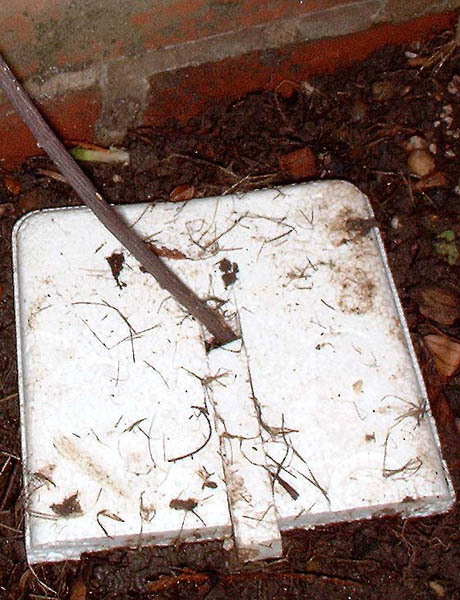 If you have cold winters a very useful tip is to take a square of polystyrene (see above) say 5″x5″x1/2″ or even much bigger if your winters are very severe. Cut a thin slot the width of the stem to the middle – remove the sliver & slide the polystyrene at ground level towards the plant until the stem is in the middle (it should be a tight fit) & then replace the sliver. Put this on before winter frosts & cover with a mulch of grass cuttings plus fleece for perhaps the first 3′-4′ (see P. loefgrenii ‘Iporanga’ below) or alternatively hessian. This will make a big difference to the amount of cold the plants can take. Others use a large plastic water container as a cloche, slit right up the side with the bottom cut off. It can then be flexed out & over the plant to protect the base. As an example of what good protection can achieve, a P. ‘Adularia’ which survived -5°C intact, died back to the ground overnight at -6°C. It then regrew from the well protected roots to my surprise. Pushing the plants too hard is not recommended though as it can take them the whole season to recover -if it recovers at all. The hardiest Passiflora species are P. lutea, P. caerulea & some of it’s hybrids & P. incarnata. All of them especially P. lutea & P. incarnata are prone to root rot & the dampness of the soil is more critical than temperature.